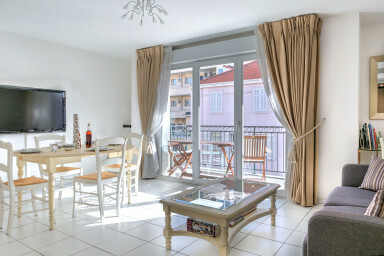 Nice and modern appartement for 6 persons, with air conditioner and next to the Palais des Festivals and beaches. Charming 55m ² apartment, located in the heart of Cannes, just next to the Suquet historic quarter. It offers all the comfort for an exceptional stay in Cannes. Ideal for delegates (10 minutes walk from the Palais des Festivals) and tourists (3 minutes walk from the beach). This 2 bedrooms well decorated apartment, can comfortably accommodate 6 people. The living room / dining room with a flat screen and a confortable sofa bed, with an access to a balcony with a table and 2 chairs. There are two bedrooms with 4 singles beds ( 90X200). There is a bathroom and a independant wc. The apartment is on the 3rd floor (with lift). The keys and badges will be given to you, on your arrival a person will accommodate you in front of the residence.